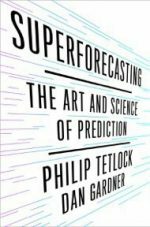 "I think Philip Tetlock’s 'Superforecasting: The Art and Science of Prediction,' co-written with the journalist Dan Gardner, is the most important book on decision making since Daniel Kahneman’s 'Thinking, Fast and Slow'." "... the techniques and habits of mind set out in this book are a gift to anyone who has to think about what the future might bring. In other words, to everyone." (Tetlock and Gardner) "...offer a fascinating insight into what we can learn from this elite group of people. They show the methods used by these superforecasters which enable them to outperform even professional intelligence analyst with access to classified data and they offer practical advice on how we can all use these methods for our own benefit whether in business, international affairs, or everyday life." "Superforecasting is a very good book. In fact it is essential reading - which I have never said in any of my previous MT reviews." "A terrific piece of work that deserves to be widely read... Highly recommended."